Hello, do you find it more difficult to make cards for men? I certainly do! 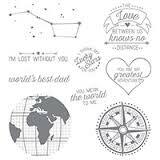 I'm lucky in that when I first discovered SU through a Coffee and Cards group, the stamp set used that afternoon was Going Global; it was one of the first SU stamp sets I ever bought and seems such a long time ago now. I chose to use light colours and Pool Party and Crumb Cake seemed to tick the right boxes. I teamed them up with some balsa wood, bought from my local model shop. I know that might appear to be an odd choice, but using a thin gauge balsa definitely adds to the effect and it can be coloured using the inkpads and a sponge or dauber. It cuts very easily and can even go through the Big Shot too. 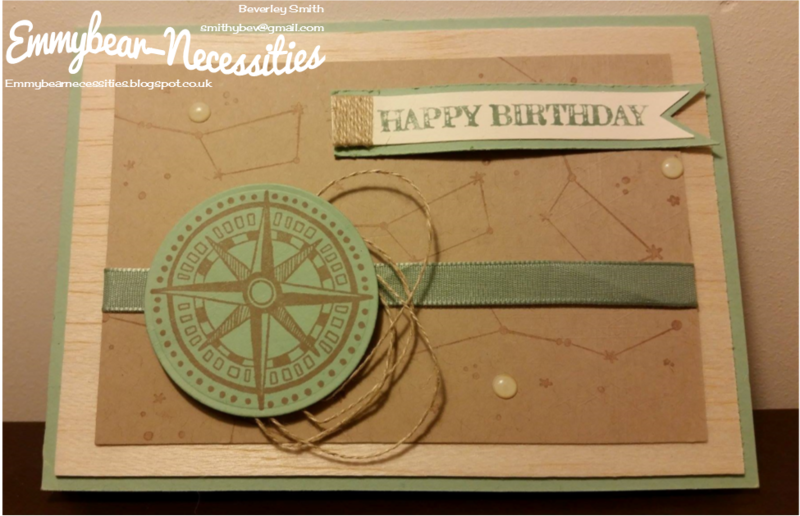 I decided to use the compass from the set as the feature whilst by using the same colour ink as cardstock, the Ursa Major constellation formed a quite subtle background. 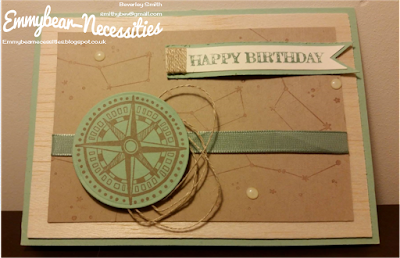 I didn't want a "fussy" card so put a band of Mint Macaron ribbon around and then wound some Linen Thread around my fingers before placing behind the compass. To complete the look I used a simple sentiment and 3 Perfect Accents, strategically placed. Did you know that the White Perfect Accents can be coloured using Promarkers? This makes them so handy to keep in stock!